As part of this year’s World Book Day, Uber teamed up with Puffin and the National Literacy Trust in a bid to help hurried mums and dads get home on time—with a bedtime storybook in tow. The Mobile Libraries initiative launched in London and Manchester in March, and the trial has selected Uber cars stocking an inspiring stack of nighttime family reading from which to choose. 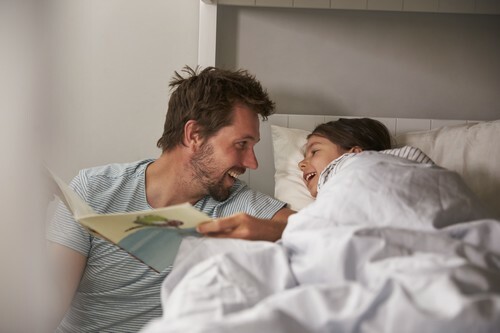 The idea was sparked following a poll—conducted by Uber—revealing that 43% of British parents say working late means they don’t get to read that all-important bedtime story. This in spite of the fact that 69% view reading time as a special aspect of their children’s bedtime routine, as well as an important way to bond. The books available will cater to children from 18 months to 12 years, including classics like Charlotte’s Web and Peter Rabbit Tales—and there’s no catch; except that the selection will only last as long as the stock does.